The Yankees and Alex Rodriguez, who managed to keep his name off the Mitchell Report, finalized their 10 year $275 million agreement which could be worth $305 million if all bonuses are met. 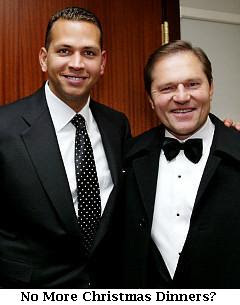 The process of reaching the agreement may have soured a 16 year relationship between Arod and his super-agent Scott Boras. On a conference call heard here, Alex described the events to the media. The three time MVP said that there were preliminary offers from other teams, but that he turned them all away because his goal was to remain a Yankee. Even if you don’t believe Alex is innocent here he did reach out to the Steinbrenners and he is going to be in pinstripes for the next 10 seasons. The Yankees expect those years to be monumental and so does Alex. He seems hungry for a World Series ring and he has plenty of incentives for homeruns. He will get a $6 million bonus for each homerun numbered 660, 714, 744, 762, and 763. The Yankees have the best third baseman in baseball and maybe the best player in history, because of that I’m willing to take him at his word. Yankee fans should be looking forward to the next ten years.